As the superstorm Sandy, also nicknamed Frankenstorm, attacked the US East Coast and New York City this week, it quickly became apparent that despite the commendable and quick response by the communities under threat, there was nowhere near the preparedness nor infrastructure in place to deal with this severe assault by Mother Nature. The view in the rich, developed world, has long been that climate change is only a risk to the developing world and that the developed world naturally has the infrastructure in place to cope with any implications. But Hurricane Sandy surprised us and proved that even a country as advanced as the US, is not immune to nor ready to face the severe challenge of climate change. This is an issue that must be dealt with urgently. It’s unclear whether we can attribute Sandy to climate change alone, but what we can say is that our weather has become more and more extreme over recent years, there are far more frequent and extreme weather events occurring than ever before, across the planet. This year alone in the US has been one of extremes with an extensive drought pushing food prices right up with a huge financial cost. And estimates this week alone are that so far that Sandy has cost the US economy at least US$ 20 billion and counting. Here in the UK, a drought was declared in March after which we unexpectedly experienced the wettest and coldest summer in decades, also with an associated huge financial cost. We might not yet be finished with 2012 extreme weather events; scientists are telling us that the rapidly accelerating Arctic ice melt could cause an extremely cold winter across the northern hemisphere. It does seem like climate change is staring us right in the face. The US has, to date, greatly underestimated the threat of climate change; the devastation caused by Sandy has proved that. Due to its low lying position and location, New York City has always been extremely vulnerable to flooding, and even without Hurricane threats, rising sea levels means it is increasingly vulnerable to flooding. Sandy must send a clear signal to the US state that urgent climate change mitigation is deeply necessary; it is an unquestionably worthwhile investment, which in the long term will save the State and US economy billions of dollars. Post-Sandy, we can be in no doubt that the US East Coast infrastructure needs a total revamp. The good news is that the States now have a chance to rebuild it with the newest, modern technology that can safeguard its buildings and communities for the future. Electricity production should also come under the spotlight. Reliance on large, centralised electricity plants has also revealed itself as a weakness; more decentralised electricity production in the form rooftop solar panels and other micro renewables would have kept a lot more power provision intact this week. New York and other coastal towns and cities now have the perfect opportunity to use their ideal coastal locations to generate local power in form of tidal, wave and offshore wind. Sandy hit the US at a time when both Romney and Obama have been criticized for downplaying the threat of climate change, something which has deeply angered environmentalists. As the storm was unfolding on Monday evening, I was invited to take part in a Huff Post Live debate discussing the issue of how to connect climate change to extreme weather events like Sandy. The consensus was that now is the time. Obama understands the climate science, he also understands the importance of green growth and the jobs it creates. With millions of Americans either having lost their home or encountered financial loss due to this event, they need to hear from Romney and Obama that this is what climate change looks like; the threat is real and constitutes the biggest challenge humanity is facing, and we must all take immediate action to address it. This can be achieved both with a clean energy revolution but also investing in climate change mitigation that can help contain future climate disasters. The idea that the choice lies in either saving the climate or the economy is nonsense; dealing with the causes, effects and outcomes of climate change will provide a huge economic stimulus it itself. Which begs the question, what are they waiting for. 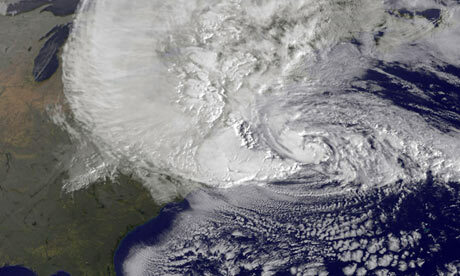 ← Is climate change heading to haunt the US in the form of hurricane Sandy?